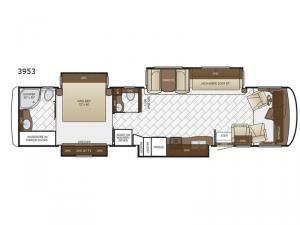 For a luxurious class A motor home you will want this Newmar Canyon Star 3953. You will find that this model has a bath and a half so there is plenty of room for your whole crew to get ready for the day. In the master bedroom you can get a good night's rest on the king bed and across the room there is a large dresser plus overhead cabinets. 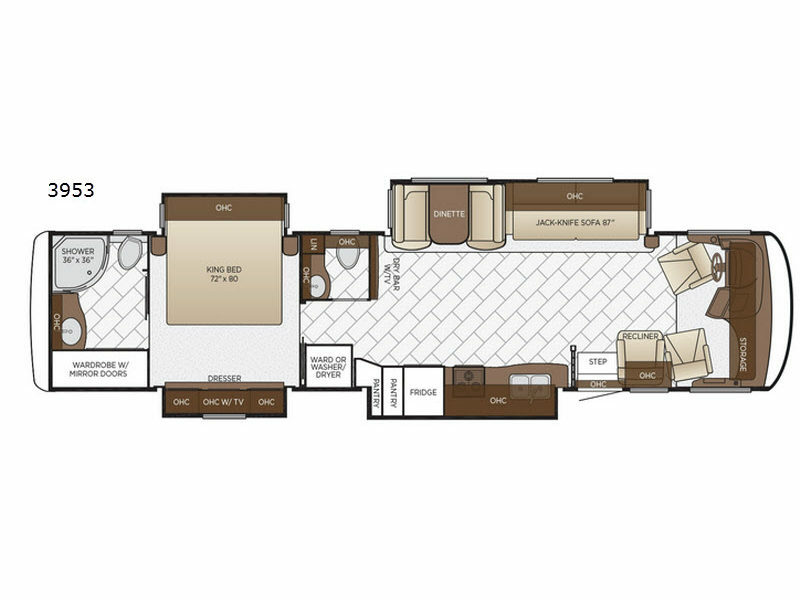 In the front living area there are plenty of seating choices which include the dinette, 87" jack knife sofa, recliner, plus the driver and passenger seats swivel around. In the kitchen you will find two pantries which provide plenty of storage for your food, plus this model has been prepped for an optional washer and dryer, so now you can keep up with your laundry as you travel! Each Canyon Star is built on a 26,000 lb. Ford F-53 chassis, and is ready to travel when you are! You can choose between two distinct exterior Masterpiece full paint finishes, two stylish interior colors, and three wood cabinet finishes. You can begin any journey from the comfort of the power adjustable driver's seat, while your traveling companion enjoys a footrest plus a stowable workstation. The galley has plenty of features from the polished solid-surface counter tops to the diamond pattern backsplash. In the kitchen you will also find a Norcold 8 cu. ft. refrigerator for your perishables and more! There is a USB charger at the passenger seat area and the dash for the driver. The road is calling your name, come answer that call with a Canyon Star!